Welcome to Las Vegas Costumes. 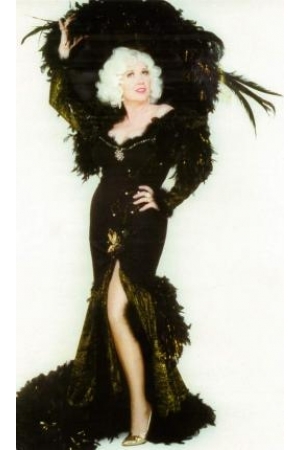 Of all the costumes to represent Las Vegas, the “showgirl” would be, in our opinion, first choice. 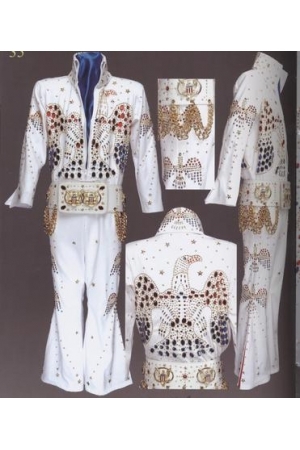 Next to represent Las Vegas it might be Elvis, third the gambling and gaming related costumes, like our playing cards or roulette wheel costumes. Fourth place would be the costumed characters that appear at the various hotels – Luxor, Caesars Palace, like “Mark Anthony” and “Cleopatra.” Finally in fifth standing, all the costumes of stage performers and stars that appear throughout the years. I can’t tell you the number of people that have come into the store and said our theme is “Las Vegas.” We’re ready! We have it all!! We specialize in Elvis and Showgirl costumes. We have many Elvis style costumes from the 50’s gold lame, Hawaiian, Army, Jailhouse, 68 Special to the 70’s jumpsuits. We have the wigs, glasses, scarves, rings and boots. The showgirl costumes are full and spectacular. Our headdresses are as high as three feet. We have all kinds of styles and colors. We have back packs, fanny packs and boas, shoes, gloves and spectacular rhinestone jewelry. People from all over the world love to take pictures in the costumes as souvenirs or buy them to take home. Don’t worry about taking them back .They are light and easy to carry and pack. While you’re in town ,you may buy a heap of things; so, one idea is to ship them back to yourself. At times we have sold people extra pieces of luggage to transport what they wanted on the plane and avoid vast shipping charges to England, for example. We are always buying out Las Vegas production shows with all their vintage stock. We refurbish what we can and then sell it in the store. It’s all about Las Vegas glitz and glamour. 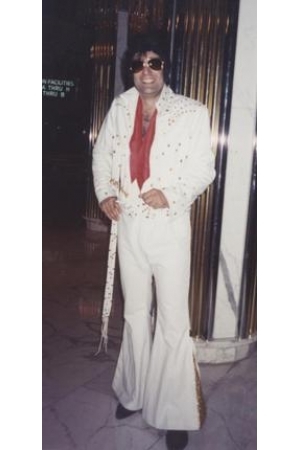 Another part of our Las Vegas costumes section is the stage performer section filled with impersonator costumes like Michael, Marilyn ,Elvis, Elton, Cher, Kiss, the Beetles, Prince, and Liberace to name a few. People frequently choose the “celebrity” theme for getting dressed up ,especially the corporate folks on convention. We encourage people to call us for the marching bands , school dance ,ballet studios and just for weird and wacky stage wear. We have plenty of small sizes for dance classes and school teams for competition, drop us a line and we will email new arrivals. In this section we also have a wide range of different headdresses. This might be just your thing if you already have the body suits or gowns and just need something to top it off.